Preheat oven to 375 degrees F (190 C) and lightly grease a 9×13 baking dish or rimmed baking sheet. Brush halved peppers with a neutral, high heat oil, such as avocado oil or refined coconut oil. Bake for 30 minutes covered. 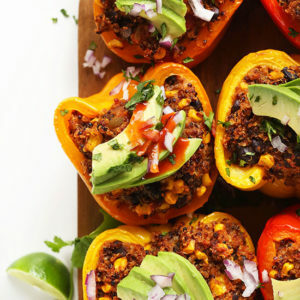 Then remove foil, increase heat to 400 degrees F (204 C), and bake for another 15-20 minutes, or until peppers are soft and slightly golden brown. For softer peppers, bake 5-10 minutes more. Serve with desired toppings (listed above) or as is. Best when fresh, though leftovers keep covered in the refrigerator for 2-3 days. Reheat in a 350-degree F (176 C) oven until warmed through – about 20 minutes.